Alphonso Davies has been voted the Canadian men's soccer player of the year, after a standout season with the men's national team and the Vancouver Whitecaps. 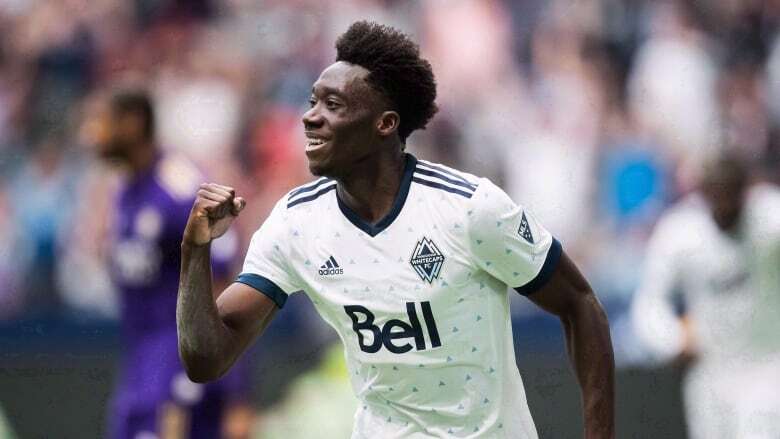 Teenage midfielder Alphonso Davies has become the youngest winner of the Canadian Men's Soccer Player for the Year Award. The former Vancouver Whitecap, who turned 18 in November, is now with Bayern Munich thanks to a record-breaking $22-million US transfer deal that will see him play for the German powerhouse through 2023. "He has been a standout performer for club and country and that is just a consistent reality now for Alphonso Davies," Canada coach John Herdman said in a statement. "For club, he picked up many an accolade, culminating with what looks like one of the biggest signings out country has ever seen. "For Canada, every time he has been asked to take a responsibility and support the team, even playing out of position, he has shown his character. He is just a humble guy who loves the game and will do whatever it takes to be successful." Christine Sinclair was named women's top player on Tuesday. The previous youngest men's winners were Simeon Jackson and Jim Brennan, who were 22 when they won in 2009 and 1999, respectively. Christine Sinclair was 17 when she won the women's award for the first time in 2000. On Tuesday, the 35-year-old Sinclair won the Women's Player of the Year Award for the 14th time. Davies finished his MLS campaign with eight goals and 11 assists. He was a commissioner's pick to the August all-star game in Atlanta, where he became the fourth-youngest player to appear in the game.